This church’s roots date back to the nineteenth century. 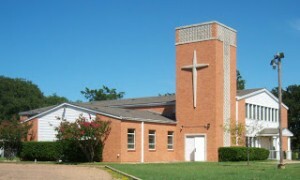 Oak Haven is the oldest continually meeting congregation of any denomination in the city of Irving. In 1880, when this area was sparsely populated, local residents from various Christian denominations met together for Sunday school classes. Having no building, the group met under a brush arbor, or bower. The original name, Union Bower Sunday School, is believed to have been derived from this union of denominations meeting under a bower. By 1905, The Methodist Episcopal Church, South sent the Reverend W.B. Hawks to organize the Union Bower Sunday School into a congregation and begin construction on a church building along today’s Eastern Grauwyler Road. The church, known as Hawk’s Chapel Methodist Episcopal Church, was dedicated in 1907. In the early 1930s, the congregation renamed the church Union Bower Methodist Episcopal Church. By the mid-1940s, members began planning a larger, modern building on the same site. They completed the new church in 1953. The rapid growth in church membership paralleled the growth of Irving during the 1950s. By 1959, the congregation was again planning a larger church. After selling their building in 1959, the members met for a time in Paul Keyes Elementary School. On Palm Sunday 1961, the new church was dedicated and renamed “Oak Haven” to reflect the natural beauty of the grounds. Inaugurated during the early years of Oak Haven was the beginning of the annual sale of smoked hams and turkeys during the Thanksgiving and Christmas seasons and the annual Ham & Bean Dinner (held the Saturday before Thanksgiving). The United Methodist Men oversee the smokes and 2015 was the 50th straight year of sales. This is the church’s largest fundraiser of the year and we are known for this throughout the community. The church celebrated its centennial anniversary on October 13, 1985. In response to a changing neighborhood, Oak Haven inaugurated a Hispanic/Spanish language ministry in October 2014. The ministry is known as the Nissi Hispanic Ministry. This was the beginning of the Spanish worship service. It has resulted in a significant increase in members and worship attendance. Going into the future, Oak Haven United Methodist Church is reshaping itself into a multicultural, bilingual, and vital congregation committed to impacting the community and growing ever more Christ-like in our love for God and neighbor.